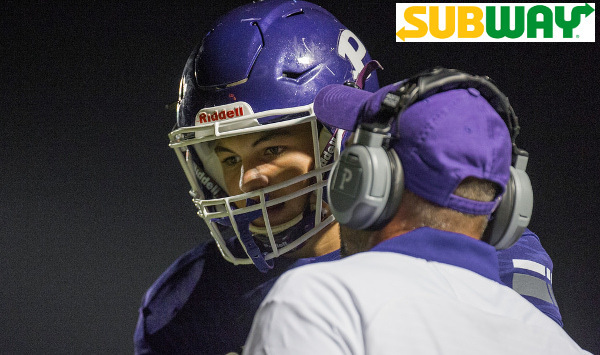 On this Friday Playoff edition of the Subway Fresh Take, we’ll recap first round playoff action from Class 6A, 5A, 4A Divisions I & II, 2-1A, and both 8-Man divisions. Shawnee Mission East 42, Olathe Northwest 17 – Shawnee Mission East built a 28-3 halftime lead and cruised to a 42-17 win over Olathe Northwest. The Ravens would open the second half with a score to pull within 28-10 before the Lancers put up two touchdowns for a 42-10 lead. Blue Valley North 48, Olathe East 30 – Olathe East led Blue Valley North for much of the game, but the Mustangs took control in the second half for a 48-30 win. Olathe East led 22-14 at halftime thanks to two Trevon Kearney touchdowns and a pick-6 by Ray Lewis. The Mustangs took a 27-22 lead mid-way through the third quarter. Blue Valley 38, Olathe South 21 – Blue Valley outscored Olathe South 17-7 in the second half to advance to the 6A quarterfinals. The Tigers got a Luke Bernard touchdown pass to Cameron Green in the third quarter to take a 28-14 lead. That lead extended to 35-14 after an Alex Totta touchdown run. Olathe North 35, Lawrence 14 – Olathe North rushed for 477 yards in eliminating Lawrence, 35-14. Daymonn Sanchez carried the Eagle offense in rushing for 313 yards and three scores, while freshman Arland Bruce added 151 yards on the ground. Olathe North led 21-0 at halftime and put the game away with two, fourth-quarter scores after Lawrence had pulled to within 21-14. The loss ended Dirk Wedd’s long coach career at Lawrence High and he had previously announced his plans to retire after this season. Lawrence Free State 47, Junction City 14 – Top-ranked Free State shut out Junction City for three quarters in building a 33-0 lead to advance in the 6A playoffs. Jax Dineen rushed for 167 yards and three scores to pace the Firebird offense. Free State took control with a 20-0 first quarter on a pair of Dineen touchdown runs and a scoring pass from Gage Foster to Jack Theisen. Derby 21, Manhattan 14 – Manhattan led 14-7 at halftime, but Derby responded with a pair of touchdowns in the second half to advance. Brody Kooser extended the ball just across the goal line late in the third quarter to provide the winning points for the Panthers. Wichita Northwest 57, Haysville Campus 24 – Campus led this game 3-2 after a Colt field goal answered a Northwest safety – then the scoring got started. Breece Hall rushed for four first-half touchdowns as the Grizzlies exploded for a 50-10 halftime lead. Garden City 24, Topeka High 21 – Garden City picked up an impressive road victory at Topeka High, 24-21. The Buffs led 9-0 early and 16-7 at halftime before the Trojans would respond. Jacqez Barksdale scored a pair of touchdowns in the third quarter to put Topeka High up 21-16. Garden City would respond mid-way through the fourth quarter on a Quinton LaPointe touchdown run for a 24-21 lead after the two-point conversion. Topeka’s next three possessions ended in turnovers in Garden City territory. LaPointe rushed for 107 yards for Garden City, while Barksdale led Topeka with 172 yards on the ground. Ky Thomas added 99 yards on 19 carries for Topeka. Mill Valley 57, KC Schlagle 12 – Mill Valley knocked out top-seed KC Schlagle 57-12 on Friday night to get back to the 5A state quarterfinals. Cameron Young rushed for 139 yards and four touchdowns and Brody Flaming passed for 250 yards and two scores. The Jaguar defense held Schlagle’s Ivan Webb to 80 rush yards and a touchdown. Webb finished his remarkable senior season with 2,863 rushing yards and 35 touchdowns. St. James Academy 19, Shawnee Heights 0 – St. James Academy used a strong defensive performance to advance to the quarterfinal round of the 5A playoffs. The Thunder held a slim 6-0 lead through three quarters thanks to a Jack Petz touchdown run. St. James added a pair of fourth-quarter touchdowns to provide the separation. St. Thomas Aquinas 52, Bonner Springs 13 – Aquinas led Bonner Springs 21-13 at halftime, but blitzed the Braves with a 31-0 second half to pull away. Cameron Jackson rushed for 145 yards and a pair of touchdowns to pace the Saint offense which racked up 579 yards of total offense. Aquinas rushed for 449 yards on the night. Will Swanson added 75 rushing yards and three rushing scores. Pittsburg 61, KC Turner 6 – Pittsburg rolled into the quarterfinals with a 61-6 victory over Turner. Senior quarterback Chase Curtis threw six touchdown passes in the win for the Purple Dragons. Curtis tossed three touchdowns to Zach Sutton and two to Dylan White. Goddard 65, Andover 7 – Goddard had no trouble with Andover this time around. After needing a late Blake Sullivan touchdown run to defeat the Trojans 21-17 earlier in the season, the Lions throttled the Trojans 65-7 on Thursday night. Goddard scored all 65 points in the first half in the dominating victory. Goddard-Eisenhower 20, Salina South 6 – After an 0-5 start, Eisenhower has now won five straight games after defeating Salina South, 20-6. The Tigers lead was just 6-3 entering the fourth quarter before Seth Golden scored a pair of touchdowns to put the game away. Bishop Carroll 41, Kapaun Mt. Carmel 6 – Braden Howell threw five touchdowns passes – four in the first half – as Bishop Carroll once again defeated rival Kapaun Mount Carmel. The Eagles led 28-0 at halftime and thwarted any chance of a Kapaun comeback as Luke Evans scooped up a Crusader fumble and returned it for a touchdown to begin the third quarter. Howell threw three touchdown passes to Joseph Holthusen. Maize 41, Wichita Heights 14 – Maize used 17 fourth-quarter points to pull away from Wichita Heights 41-14 on Friday night. The Eagles led Heights 21-14 after the first quarter and 24-14 at halftime before shutting out the Falcons in the second half. The Maize defense forced three turnovers in the second half to help that cause. Eagle QB Caleb Grill passed for 187 yards and threw three touchdowns passes in the victory. Dalyn Johnson also provided balance by topping the 100-yard mark with 103 yards on 27 attempts. The Eagles held K’Vonte Baker in check as he finished with 70 yards and a touchdown on 21 attempts. De Soto 42, Tonganoxie 7 – De Soto handed Tonganoxie its first loss of the season in a 42-7 defeat. The Wildcats led 21-0 at halftime behind two Bryce Mohl touchdown passes and a Jack Barger scoring run. Trevor Watts caught a pair of touchdown passes and rushed for a score for De Soto. Fort Scott 50, Chanute 14 – Fort Scott rushed for more than 330 yards in beating SEK League rival Chanute for the second time this season. Zarek Fewell rushed for 293 yards and five touchdowns to pace the Tiger offense. Jesse Jones also passed for 165 yards as the Tigers put up nearly 500 yards of total offense. Bishop Miege 58, Basehor-Linwood 6 – Defending champion Bishop Miege cruised to a 58-6 victory over Basehor-Linwood in a rematch of the 2016 state semifinal. The Stags exploded for 29 points in the first quarter and led 52-0 at halftime. The Stag defense returned an interception for a touchdown and blocked a punt for another score. Labette County 34, Paola 7 – Easton Dean connected with Kale Irwin on a touchdown pass before halftime to give Labette County a 13-7 lead it wouldn’t relinquish. The Grizzlies then rolled in the second half to a 34-7 victory over Paola. T.J. Mayhue added two of his three touchdown runs after halftime. Andover Central 30, Mulvane 21 – After Mulvane and Andover Central exchanged touchdowns in the first two quarters, Matt Lymon’s 80-yard punt return gave the Jaguars a 20-14 halftime lead that they would not relinquish. Reagan Jones passed for 154 yards and two touchdowns as Andover Central defeated Mulvane. In his final high school game, Mulvane quarterback Jayden Price passed for 358 yards and three scores. Andale 64, Wamego 13 – Andale cruised to a 64-13 victory over visiting Wamego. The Indians led 43-7 at halftime in advancing to the quarterfinals where they will take on Andover Central. Andale defeated Andover Central 28-21 in the season-opener. Maize South 49, Wellington 7 – Wellington scored first, but Maize South controlled the game the rest of the wain for a 49-7 win. The Mavs led 28-7 at halftime and extended that lead to 35-7 after three quarters. Maize South advances on to take on McPherson in the next round. The Mavericks defeated McPherson 9-0 earlier this season. McPherson 15, Buhler 14, OT – In the game of the night, McPherson and Buhler entered overtime in a defensive slugfest tied 7-7. Buhler scored first on a Dalton Brown short touchdown run to take a 14-7 lead. McPherson responded with a Drew Labertew touchdown run and the Bullpups made the decision to go for the two-point conversion and the win. Jace Kinnamon lined up in the Wildcat on the two-point attempt and sprinted left tossing the ball to receiver Gabe Hoover on an apparent reverse. Hoover then flipped the ball to the right side to a wide-open Kyler Hoppes for the winning conversion. Hoppes had motioned from his QB position to tight end on the right side before the snap. Topeka Hayden 48, Prairie View 6 – Hayden scored 21 points in the first and second quarters to roll past Prairie View, 48-6. Sampson Huston passed for 181 yards and connected with DeShawn Hanika five times for 131 yards. Huston threw three touchdown passes with two of those going to Matthew Moore. Burlington 22, Columbus 21 – Burlington edged Columbus 22-21 to advance to the quarterfinals where the Wildcats will meet Topeka Hayden. Burlington trailed Columbus 13-8 at halftime, but scored twice in the second half to win. The Wildcats were pinned against their own goal line late in the game but avoided a potential safety that would have given Columbus the lead. Holton 9, Baldwin 8 – Holton slipped by Baldwin 9-8 on Thursday night. The Wildcats let 9-0 at halftime and held on as Baldwin score a touchdown on the game’s final play and added the two-point conversion. Frontenac 41, Girard 6 – Frontenac advanced to the state quarterfinals for a fourth consecutive season with a 41-6 victory over Girard on Friday night. Peyton Brown rushed for two scores and added a touchdown passing as the Raiders built a 27-0 lead in the second quarter. The Raiders defeated the Trojans 33-6 in the season-opener. Clay Center 21, Nickerson 20 – Clay Center rallied from a 20-6 deficit to shock Nickerson, 21-20. Peyton Lane tossed an 8-yard touchdown pass to Connor Last with 12 second remaining and Lane's PAT propelled the Tigers to their first playoff victory since 1993. Scott City 21, Kingman 14 – Jarret Jurgens scored on a 35-yard touchdown run with less than four minutes remaining to give Scott City its first lead and propel the top-ranked Beavers into the quarterfinals. Scott City struggled with four turnovers in the game but eventually clawed its way out of a 14-0 hole against Kingman. Devin Williams rushed for two touchdowns for Kingman to give the Eagles a 14-0 lead in the first half. Wyatt Hayes’ touchdown run pulled Scott City to within 14-7 at halftime and the Beavers evened the score on a Marshall Faurot touchdown reception from Parker Gooden. Smoky Valley 12, Wichita Collegiate 2 – Smoky Valley bumped into the quarterfinals for the second straight year and ended Collegiate’s season at 5-5. Smokey Valley led 6-0 at halftime and had an intentional grounding call in the third quarter that resulted in a safety for the Spartan’s only points. The Vikings scored in the final 34 seconds after a long punt return and late hit. On 4th-and-2 from the 3, Kyle Anderson scored. He finished with 25 carries for 106 yards and had a key interception. Holcomb 46, Colby 15 – Holcomb raced out to a 33-0 lead in the first half in defeating Colby for the second time this season. The Longhorns won the earlier meeting 27-0 back in Week 5. Kaden Tichenor led the Holcomb offense with 161 yards and two touchdowns. Trey Gilbert completed 10 of 15 passes for 168 yards and a pair of scores. Carter Blackburn erased all doubt of a second-half challenge from Colby when he returned the third-quarter kickoff back 82 yards for a touchdown. Jefferson Co. North 36, Jackson Heights 20 – Jefferson County North used a 22-0 third quarter to remain unbeaten and pull away from Jackson Heights for a 36-20 win. The Chargers and Cobras were tied 14-14 at the half before Boston Lane hit Brayden Summers on a 61-yard touchdown pass in the third quarter. Lane then hit Ridge Robertson on a 78-yard pass for a 28-14 lead. Robertson’s short touchdown run ended the third quarter with the Chargers up 36-14. Jackson Heights rushed for 298 yards in the loss, while JCN was more balanced with 174 yards on the ground and 198 through the air. Olpe 62, Yates Center 0 – Olpe defeated Yates Center 61-0 during the regular season, and 62-0 in the playoffs on Friday night. The Eagles led 42-0 at halftime. Blaine Hinrichs rushed for 105 yards and three scores to lead the Eagles. Centralia 63, Doniphan West 24 – Centralia rolled to a second victory over league-rival Doniphan West this season. The Panthers led 34-8 at halftime and extended that lead to 48-8 in the third quarter. Centralia defeated the Mustangs 58-6 earlier in the season. St. Mary’s Colgan 48, Lyndon 6 – Fourth-ranked Colgan blitzed No. 5 Lyndon 48-6 on Friday behind a big first half. The Panthers needed less than two minutes to get on the board as Max Wilson took a pitch 23 yards for a 7-0 lead. After a Tiger fumble, Cade Simmons broke free for a 15-yard run and a 14-0 lead. The Panthers then pulled away with three touchdowns on three 1-play drives in the second quarter. After stopping Lyndon on fourth down, Wilson went 66 yards untouched for a 21-0 lead. The Tigers fumbled on their next play after the kickoff. Simmons broke several tackles on a 25-yard run on the next play. After a short Lyndon Punt and a strong return by Wilson, the Panthers added another score as Bryce Hutchins went 17 yards. Colgan led 35-6 at halftime. Wilson rushed for 157 yards and two scores in the first half. Ell-Saline 44, Sedgwick 41 – Quarterback Nick Davenport came off the sidelines late in the first half and led Ell-Saline to a 44-41 victory over Sedgwick. Davenport, who was injured last week against against Smith Center, came in with the Cardinals trailing Sedgwick 24-7. Sedgwick led 24-14 at half and extended that lead to 31-14 in the third quarter before Ell-Saline closed to within 31-21 after three. Davenport’s touchdown pulled the Cardinals to within 31-28 early in the fourth quarter before Sedgwick added a field goal to lead 34-28. A 15-yard Luke Parks’ touchdown run gave Ell-Saline a 35-34 lead. Shortly after, Davenport sacked Sedgwick quarterback Hooper Schroeder for a safety and a 37-34 lead. Davenport’s fourth touchdown made the lead 44-34 with 2:20 remaining before Sedgwick scored on a Schroeder touchdown. Davenport would recover the onside kick, and would end the night with 193 rushing yards and four touchdowns with 85 passing yards. Plainville 21, Meade 0 – After a scoreless first half, Plainville blanked Meade 21-0 to advance to the quarterfinals. Noah Hansen’s 29-yard touchdown put the Cardinals up two scores in the third quarter. Smith Center 84, Medicine Lodge 7 – Smith Center scored 41 points in the second quarter in taking a 62-0 halftime lead over Medicine Lodge. The top-ranked Redmen will travel to Elkhart in the quarterfinals next week. Elkhart 35, La Crosse 6 – Elkhart defeated La Crosse for the second time this season. The Wildcats beat the Leopards 30-20 in a weather-shortened game to open the season. On Friday, Elkhart led 22-0 at halftime and 22-6 after three quarters before adding a pair of touchdowns in the final quarter. West Elk 46, Udall 0 – West Elk cruised to a 46-0 victory over SCBL rival Udall to advance to the state quarterfinals where the Patriots will host top-ranked Burlingame. William Silvey rushed for 150 yards and three scores to pace the Patriot offense. Burlingame 34, Victoria 24 – After an injury to all-state quarterback Dalton Sporing late in the first half, Burlingame responded with a big second half in defeating Victoria, 34-24. The Bearcats’ 16-point third quarter turned a 16-12 deficit into a 28-16 lead. Victoria would close within 28-24 on a Collin Kisner touchdown run, but Montana Giffin’s touchdown pass to Seth Greenwood provided a two-score advantage in the fourth quarter. Giffin’s two pass attempts both resulted in touchdowns after replacing Sporing behind center. St. Paul 56, Central Burden 6 – Braven Born threw four touchdown passes as St. Paul rolled to a 50-point win over Central Burden to open the playoffs. Born connected with Brenden Doherty on two touchdown passes, while Collin Carlson paced the ground attack with 98 rush yards and four scores. The Indians played without running back Adam Albertini due to injury. Osborne 64, Clifton-Clyde 14 – Osborne defeated Clifton-Clyde for a second consecutive season in the first round, and by almost an identical score. The Bulldogs beat the Eagles 64-14 on Friday night after winning 64-16 last season. Denton Schurr rushed for 144 yards and four touchdowns for the Bulldogs. Darnell Holloway passed for 139 yards and two scores, and added 119 yards on the ground and two touchdowns. Central Plains 58, Macksville 12 – Central Plains has never lost a first-round playoff game since the formation the Oilers from the consolidation of Claflin and Quivira Heights. The Oilers improved to 6-0 in the first round with a 58-12 halftime victory over Central Prairie League rival Macksville. The Central Plains defense started the scoring when Mason Doll recovered a Macksville fumble in the end zone for an early lead. Alex Hickel’s 55-yard touchdown run made it 14-0 Oilers before Macksville scored on a Kody Mead run. Oiler QB Myles Menges then hit Alex Barton on a 41-yard touchdown strike to extend the lead to 22-6, but Mead would hit Karson Waters on a touchdown pass to pull the Mustangs within 22-12. Central Plains would then score the final six touchdowns in the second quarter to win – sealing it with a pick-6 by Kade Beck. Alex Hickel led Central Plains with 106 yards rushing and three scores. Spearville 42, St. Francis 20 – In the highly anticipated rematch of the 2016 state semifinal, Spearville scored 34 consecutive points to knock out St. Francis 42-20. St. Francis opened the scoring with on a 34-yard touchdown pass from Brady Dinkel to Wyatt Hackler. Less than 20 seconds later, Spearville was on the board as Alex Fisher broke a 47-yard run. Bailey Sites’ two-point conversion run gave the Lancers an 8-6 lead; a lead they would not surrender. Kolby Stein hit Carson Rich on a touchdown pass and Sites added a short scoring run to give the Lancers a 22-6 halftime lead. The lead ballooned to 34-6 until Tate Busse pulled the Indians to within 34-14 in the third quarter. With the win, Spearville avenges last year’s 36-30 loss at St. Francis in the semifinals. The Lancers will take on Central Plains in the state quarterfinals for the fourth consecutive season. Spearville won last year 58-28 last year and 58-26 in 2015 on its way to the 2015 state title. Central Plains won 42-40 in 2014 when the Oilers won the 8M-I title. South Central 27, Little River 20 – South Central defeated Little River in the first round for a second consecutive season, although this time around was much closer than last year’s 54-28 decision. The Timberwolves led 13-6 at halftime and 19-14 after three quarters. Each team scored in the fourth quarter, but South Central was able to hold on for the victory and advance to the quarterfinals for a second consecutive season. Hoxie 50, Ness City 0 – The Indians rolled over Ness City behind a big game from Latham Schwarz with 24 carries for 210 yards and four scores. The Indians led 22-0 at halftime. Ness City running back Brennan Chacon suffered injury in the contest and had just six yards. He entered the game with 910 yards on the season. This is Hoxie’s first playoff win since 2013. Caldwell 42, Waverly 34 – Caldwell went on the road and defeated Waverly, 42-34. The Blue Jays led 6-0 after one quarter and 20-12 at halftime. The two teams played to a 22-22 tie in the second half. Dakota Volavka rushed for a touchdown and caught a touchdown pass from Corbin Rice. Jalen Risley also caught a pair of touchdown passes for the Blue Jays. Hanover 64, Mankato-Rock Hills 32 – Rock Hills battled Hanover for a half, but the Wildcats used a big third quarter to pull away for a 64-32 win. Hanover led 26-24 at halftime, but scored 26 points in the third quarter. Daiken Stallbaumer rushed for four touchdowns and threw two touchdown passes to lead the Wildcats. Hutchinson Central Christian 66, Pleasanton 34 – In its first playoff appearance since 2008, Pleasanton showed little hesitation in driving the field and taking an 8-0 lead early on a touchdown pass from Kaden McKee to his brother Kasen McKee. However, Central Christian star-quarterback Nate Heneha returned the ensuing kickoff for a touchdown to ignite the Cougar score. Central Christian eventually led 34-8 and outscored the Blu-jays 66-34. Pike Valley 62, Axtell 12 – After a competitive first quarter, Pike Valley outscored Axtell 30-0 in the second quarter and ended this game shortly after halftime. Davante Hammer led the way for the Panthers in completing 7 of 8 passing for 155 yards and three touchdowns. Hammer also rushed for a game-high 89 yards and three more scores. Quinn Buessing led Axtell with 221 yards passing and a score. Pike Valley held the Eagles to just 20 rush yards on 11 attempts. Hodgeman Co. 59, Northern Valley 14 – Hodgeman County scored 30 points in the second quarter to turn an 8-8 game into a 38-8 halftime lead. The Longhorns then cruised to a 59-14 victory at Northern Valley. Trevor Morgan scored on a touchdown run, a touchdown catch, and kickoff return for another touchdown. South Barber 68, Rolla 8 – South Barber rolled to a 60-point win over a Rolla team that entered the playoffs with just two victories. The Chieftains will travel to Hodgeman County next week. Otis-Bison 60, Sylvan-Lucas 26 – Sylvan-Lucas led the Cougars, 20-6 early, before Otis-Bison scored 38 unanswered points. Cougar quarterback Anton Foust had another huge game with 287 total yards and five scores. Daniel Scott had a nice all-around game with 11 carries for 76 yards, along with nine tackles and an interception. Sylvan-Lucas recovered back-to-back onside kicks to start the game. Owen Krueger delivered 34 carries for 218 yards. Mustang quarterback R.J. Haberer didn’t play due to a knee injury, and Otis-Bison tailback Blake Bahr is also banged up. Ingalls 50, Pretty Prairie 32 – Ingalls advanced to the state quarterfinals with a 50-32 victory over Pretty Prairie. Ingalls appeared to set the tone in this battle of the Bulldogs by shutting out Pretty Prairie 22-0 in the first half, but the teams combined for 60 points in the second half. Ingalls extended its lead to 28-0 after halftime on a long touchdown pass from Timothy Gillen to Easton Irsik, but two Lane Bearce touchdowns quickly brought Pretty Prairie within 28-16. Irsik then hauled in a touchdown pass from Tate Davis to push the Ingalls lead to 34-16. Pretty Prairie ended the quarter with a touchdown to make it 34-24, but Ingalls’ Mikel Osbourne scored two of this three touchdowns in the fourth quarter to hold on.